The movie Final Destination 5 is out and I’m dying to see it. Friday I found out that Keith not only hasn’t seen 3 or 4 (the usual average missed in a series of movies) but he has yet to see any of them. I can now report we officially have a Final Destination edumacation – that is, except for the new and improved #5. Full-screen trailer can be seen here. For those who don’t know what the movies are about, each starts something like this. One person within a group has a vision of something catastrophic that’s about to happen. This ‘vision’ of impending doom shakes the person up, causing them to freak out and immediately abandon whatever it is they’re doing. A small group of people also follow his/her lead, thereby saving their own lives when that vision actually comes to life a few minutes later. Thing is, this whole new series of events screws up what they call ‘death’s design’ – so one by one, each person of that group meets their fate in some freak accident. And, they die in the same pecking order as they would have had they not exited their original… final destination. I haven’t watched this much tube in like five years or more – my eyes hurt. FD1 Friday night, FD2 Saturday morning, FD3 Saturday night and the FD4 Sunday afternoon. Any Final Destination trivia can be thrown this way, please. Never, under any circumstance, should you stand anywhere near a barbed wire fence. When boarding your local roller coaster, think twice about actually belting yourself in. Always look both ways before crossing the street. Twice. Three times, even better. When entering a tanning bed, never pull it all the way closed. If you ever go visit Paris, make sure you’re not on Flight 180. In fact, if you see those three numbers listed anywhere near you in that particular order – run, don’t walk. When swimming in a public pool, it may actually benefit you to wear your swimmies. Avoid nail guns at all costs. Hammers still do the job well, with a little more effort involved. A fire escape may not serve as an actual escape. If your car has had electrical problems in the past – you may want to avoid car washes. Never ever enter an elevator with someone who is holding a box of prosthetic hooks. Duct tape has an endless variety of uses – including safeguarding your house. If a pigeon continually crashes into your dentist’s office window – leave immediately and find another dentist. A vulture is described as: a large bird of prey, characteristically having dark plumage and a featherless head and neck, feeding chiefly on carrion (carcasses of dead animals). Ironically enough, a second definition is listed below the initial one: A person of a rapacious, predatory, or profiteering nature. Why would someone not want to be around a person in life – but choose to circle overhead after they’re dead and gone? A couple of days ago a dear relative of mine lost a courageous battle with a terminal illness. This person died alone, without their children. This person cried about their children and continually asked ‘what could I have done so horrible that they wouldn’t want to see me or even speak to me?’. I saw the tears. I saw the hurt. I saw the raw pain. I saw it. My mother saw it. They did not. They were immediately made aware of the situation as it began last August, when the first surgery occurred. Since then there have been multiple hospital stays, tests, scans, and more tests. I relayed information to them as I had it. The unresponsiveness forced me to type an email to inform of the finality of the illness. I had to send a freaking email to say the word terminal. The very evening of this person’s death, we were told to get there quickly – the heart is failing. I called and left word with the children, who of course are grown. It’s bad, I said. If you want to see him, you’d better get there quick. I left the room number. Keep your sorry excuses. Continue to justify abandoning your parent at a time when they needed you the most – as they lay there dying. I hope you sleep well at night. Instead of counting sheep, maybe you can count all those tears your father shed for both of you. Another one has happened. A death, albeit a celebrity – at the hands of an automobile texting behind the wheel. Dr. Frank Ryan, a plastic surgeon to the stars, gained even further celebrity status when he controversially performed ten procedures in one single day on the reality series star Heidi Montag. 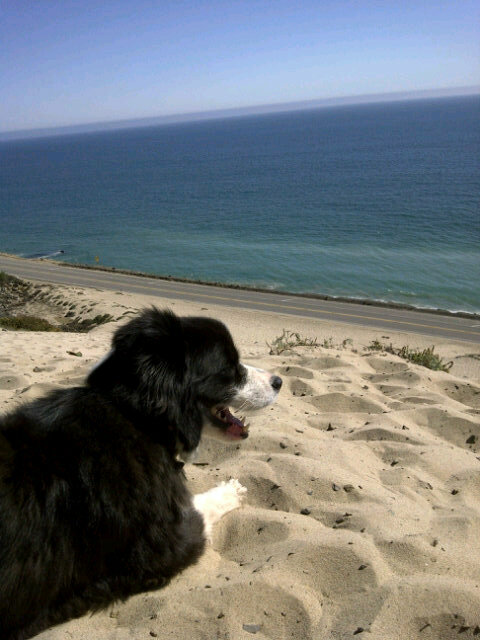 Dr. Ryan was driving along the Pacific Coast Highway immediately following a scenic hike with his beloved dog, Jill. 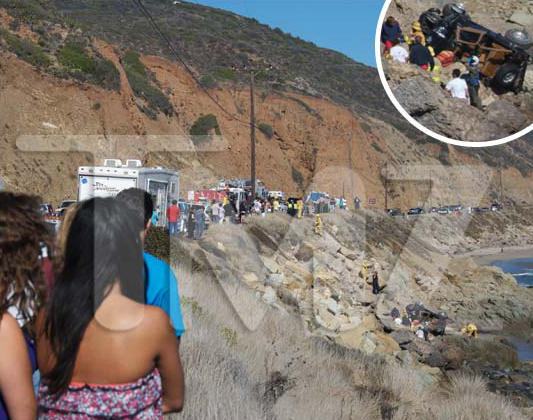 He snapped the below picture of sweet Jill lying in the sand atop a cliff, as she gazed longingly towards the sea. Twitter has become increasingly popular over the past few years, and Dr. Ryan seemed to have become as fond of it as I. Personally, I feel it’s the one social network in which you can share your thoughts with the rest of the world… without people yacking back at you. Rather, it doesn’t appear on your own page if they do – it dirties up their own. I know this is a hard one to look at, but there could be worse. Some of us need to see the reality of our actions… because I know I did. I’m ashamed to admit that texting while driving is something I myself used to do. Before all the hype and headlines about the dangers it brought, I did it. Trust me when I say I’m not proud of it, and have had a few very close calls resulting from this selfless and careless act. I can’t tell you exactly what it was that changed my whole outlook – maybe it was the close calls, maybe all the news headlines… or maybe it was that dreaded four-minute video that circulated around on facebook and elsewhere. Whatever the case is – I realize how very lucky I am. Texting while driving can be life changing, and life taking. For yourself, and for others. We don’t need the celebrity status to deem ourselves invincible… we have the uncanny ability of feeling that all on our own!! Please don’t chance it. I’m still at a loss for words – for this I am sorry. My nieces take my breath away with their beauty… both of them. I see my own daughter, her father and family completely torn to pieces. that this would become the only answer. It has all become a mind game to me – of whether this really happened… or not. There are far too many people depending on your strength for their own selves. You are way too young to exit. All the people who turned out tonight love you so… and the tears of tough men abound. I wish you and I had talked before you left. I so wish for that. A little bird sits on the window sill, watching me type… and still I think of you. I do believe you must be happy beyond words right now. And at peace. Finally, at peace. I am at a loss for words this morning. Nothing that I write will be able to convey my thoughts in the right context at this very moment. Nothing. My sister in law took her own life last night. It can’t be real, I’m thinking, even this morning. There’s just no way this can be real. She has two daughters, the oldest of which will graduate from high school this upcoming school year. Two daughters who are now motherless. The other heartbroke family members left behind include her mother, her father, her brother (my soon to be ex) and sister, two nieces and a nephew, and many cousins, aunts and uncles.